Studying Japanese bookkeeping exam topics, I had a chance to go over the difference between Equity method and Consolidated F/S. I tried making a sample case study, which is illustrated below, to deepen my understanding. Please be noted, therefore, that the following explanation could be wrong because I didn’t refer to any specific study materials to make the following summary. Suppose P corp. acquired some part of outstanding common stock of S corp.
Below is the S corp’s balance sheet, which is revaluated at its fair value. P corp. acquired 100% of the outstanding common stock of S corp. for $40,000. Purchase method is to be adopted in the consolidated financial statement of P corp. In the context of Japanese bookkeeping exam, howeve, the goodwill should be amortized within a period to the extent it doesn’t exceed 20 years. P corp. acquired 40% of the outstanding common stock of S corp. for $40,000. Equity method is to be adopted in the consolidated financial statement of P corp. When preparing for the consolidated balance sheet under equity method, you don’t add up the respective balance sheets of the two or more companies. Instead, the amount of the P corp’s investment in S corp. is reported as a part of the asset in the consolidated financial statement. 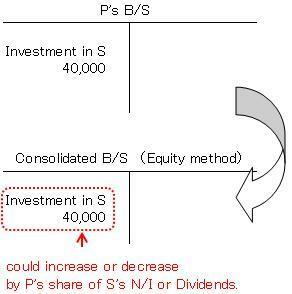 And this amount (=$40,000) changes by the amount of P copr's share of the net income or the amount of dividend of S corp.
Again, in the context of Japanese bookkeeping, this $12,800 part is to be amortized over a period, which decreases the amount of investment in S corp. I don’t know what they would do in USGAAP, but I don’t think they would do in the same way as JGAAP, because the amount of Goodwill goes through impairment test instead of periodical amortization in Purchase method. It’s fun to encounter such differences of the accounting treatments between USGAAP and JGAAP, isn’t it?